Participation in chorus requires that you attend vocal lessons - known as choral workshop - and chorus rehearsals which take place once a week during the T & D/advisory period. The choral workshop classes meet once every 8 days as part of the Special Area rotation. Choral workshop allows students to work on the details of their music and helps to refine their vocal skills in a small group setting. During these classes students will also learn basic music theory and ear training, and receive instruction through the use of technology. Chorus is a graded subject. The 6th Grade Chorus meets every Thursday morning during T & D/advisory. This group learns the basics of singing 2 and 3 part music in preparation for concerts and their future involvement in the 7th and 8th grade chorus. The 7th Grade Chorus meets every Wednesday morning during T & D/advisory and 8th Grade Chorus meets every Tuesday morning during T & D/advisory. This is a continuation of the musical experiences gained in 6th grade. 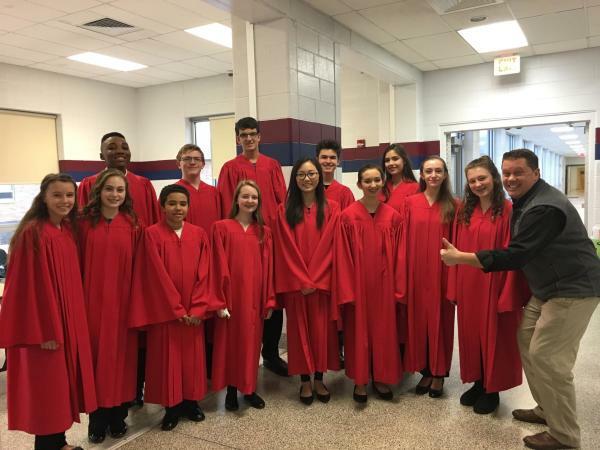 Rosa members of the All South Jersey Junior High School Chorus pose with Mr. Graser after their concert.